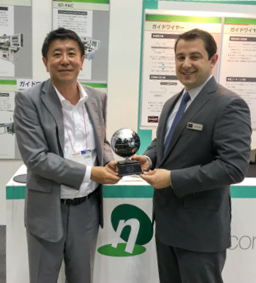 Glebar honored Naigai Corporation, our Asian sales distribution partner for over 40 years, at MEDTEC Japan 2016 on Thursday, April 21st, at 11:00am local time. Headquartered in Japan, Naigai has been Glebar’s distribution partner since 1976 and sole distributor in Japan and in Asia since 1984. The company imports, exports and markets domestically machine tools, surface treatment equipment, grinding and thermal materials. Since 1998, Naigai has been a leader in the sales of medical equipment including those for medical guidewires and the Glebar machines which manufacture these products. Across the span of their 40-year partnership, Glebar and Naigai have been successful in opening new markets for Glebar machines in Japan, Vietnam, Philippines, South Korea, Malaysia, Singapore and Thailand.